The snow has melted, Ice Out was called long ago, and now thanks to the efforts of dozens of volunteers on May 12, Lake Winnipesaukee is ready to welcome her slew of summer visitors. Berkshire Hathaway HomeServices Verani Realty agents and their families walked the beaches and even took to the water to clean up Center Harbor Boat Launch as part of the first annual Lake Winnipesaukee Spring Clean Up. Verani Realty also sponsored the event through VeraniCARES, which engages Verani Realty agents and employees in philanthropy and social development. VeraniCARES is supporting many community and charitable initiatives happening across New Hampshire and Massachusetts during the month of May as part of its May Day campaign, which is expected to disperse $40,000 to those in need through nonprofits. 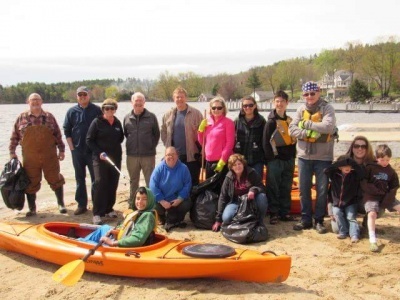 The first annual Lake Winnipesaukee Clean Up involved dozens of community members and covered towns throughout the Lakes Region, including Gilford, Laconia, Alton Bay, Meredith, Moultonborough, Tuftonboro, and Wolfeboro. Volunteers celebrated their accomplishments with a barbeque and raffles for prizes at the end of the day. For information about the Lake Winnipesaukee Spring Cleanup and for photos from the event, visit their public Facebook group. The VeraniCARES initiative kicked-off in 2015 and has donated $55,000 to local communities since its inception. To learn more about VeraniCARES, visit their website.